From the summer of 1842 through the fall of 1843, Nathaniel & Sophia Hawthorne kept a common journal of their daily lives in a notebook currently housed in the Pierpont Morgan Lib. 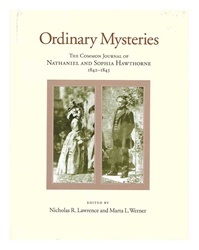 Intended solely for their own eyes, the journal records the ordinary events & activities that occupied them as newlyweds: walks through the countryside around Concord, appraisals of their new home, encounters with neighbors (among them Emerson, Fuller, & Thoreau), descriptions of the weather & the changing seasons--all material that Hawthorne would later draw on for the preface to his second collection of tales, “Mosses from an Old Manse” (1846). Its most persistent note, however, is the mutual expression of marital happiness, & this aspect of the journal is absent from Hawthorne’s preface. For over a century the journal has been available in pub. form only as a mutilated text, ed. initially by Sophia, who divorced Nathaniel’s entries from her own & presented them as extracts from his solo notebooks. This vol. makes available for the first time a full facsimile ed. of the journal, preserving the interplay of the Hawthornes’ collaboration & revealing the censorship executed by Sophia on the mss. after Nathaniel’s death.